It seems another month has come and gone, where does the time go? It was another busy month in our kitchen. We missed our kitchen dearly when we were out of town for a family funeral, I do so dislike eating out for every meal while away from home. This past month I bought The New Artisan Bread in 5 Minutes a Day for my Kindle app on the iPad. Needless to say we’ve been enjoying the results. The boys are especially loving the brioche bread. 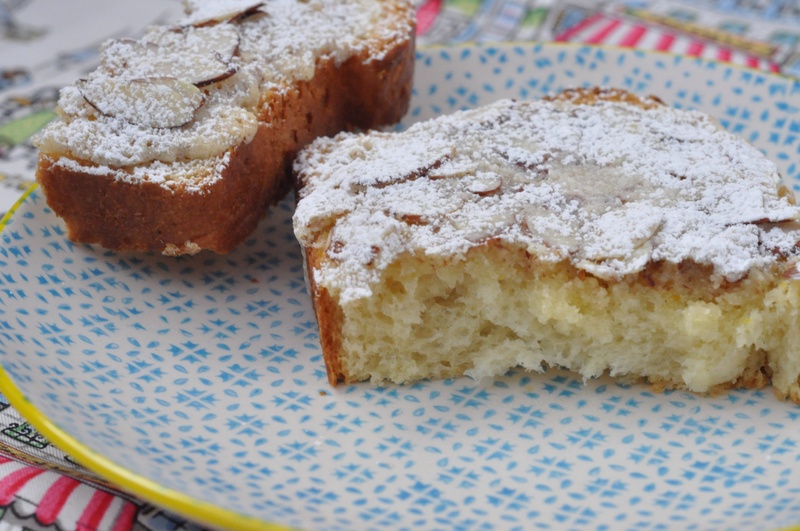 The first photo is Bostock made from a brioche loaf. 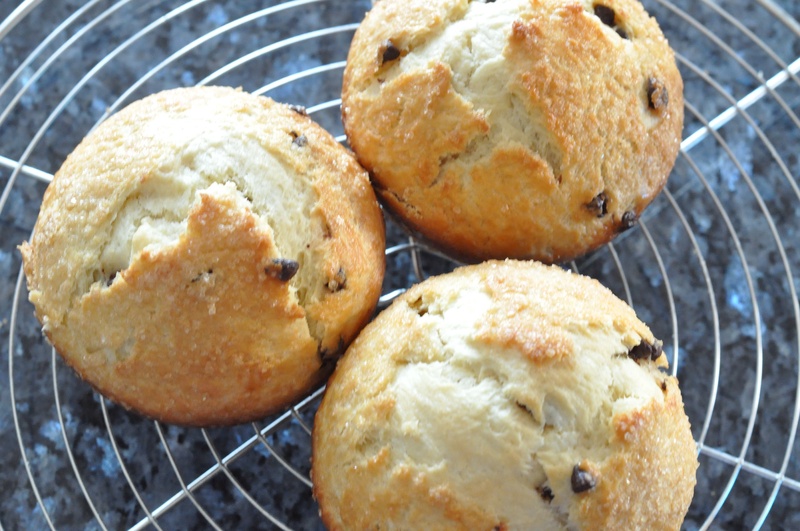 The second photo is of brioche rolls with mini chocolate chips. I may have created monsters, the boys want brioche all the time now! As I mentioned we were out of town for a family funeral. The boys were beyond thrilled when they saw this bouquet arrive from Josh’s company. It is from Edible Arrangements and was quite delicious. The company advertises on television and the boys said they always wanted one of those! The doves are slices of pineapple covered in white chocolate, yum! I didn’t get the picture taken until after we attacked it, there were six doves and a lot more other fruit as well! This past weekend we went to Whole Foods after the farmer’s market. I browsed the dairy section and it seems I had a yogurt craving! I was also thrilled to find Quark. I so enjoyed it while living in Germany and it is difficult to find here. I haven’t decided how I’m going to use it yet. Also this past weekend Josh took the boys to the store 6:30 Sunday morning. Why, they like to wake up early! He figured he would run out and get supplies for dinner (chili for the Super Bowl) and while there it seems they all decided they wanted crepes for breakfast. Josh is the crepe master in the house so the boys love to watch closely. Inspired from a restaurant we went to recently Josh made caramel crepes with bananas. They were a huge hit! Is there anything better than weekend breakfasts?! Finally we have today’s lunch. Last week when Josh was out of town I made this a couple times and enjoyed it. It is wonderful on a cold winter’s day. All right, it isn’t as cold or snowy here as the Northeast or Midwest, but it’s still winter! 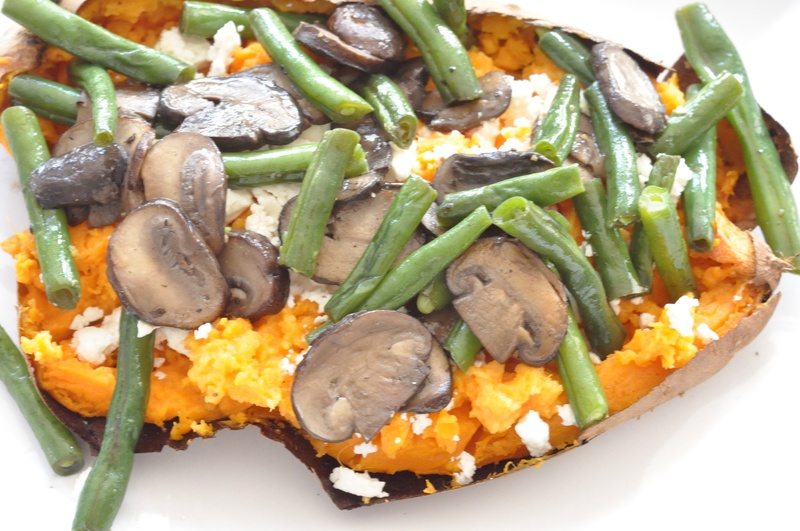 This is a warm and hearty dish of a baked sweet potato topped with crumbled feta cheese and sautéed mushrooms and green beans. Thanks to the lovely Celia at Fig Jam and Lime Cordial for hosting the monthly roundup of In My Kitchen posts. Click the link and find out what is happening in kitchens across the globe! What is happening in your kitchen? This entry was posted in In My Kitchen and tagged baked sweet potato, Bostock, brioche, caramel banana crepes, Edible Arrangements, quark on February 3, 2015 by Gretchen. I have that same problem reading food blogs! The baking looks wonderful! Well done! Thanks! Baking is such fun and the results quite tasty! The boys always look forward to baking days. Lucky you with a wonderful family that will make such lovely crepes! 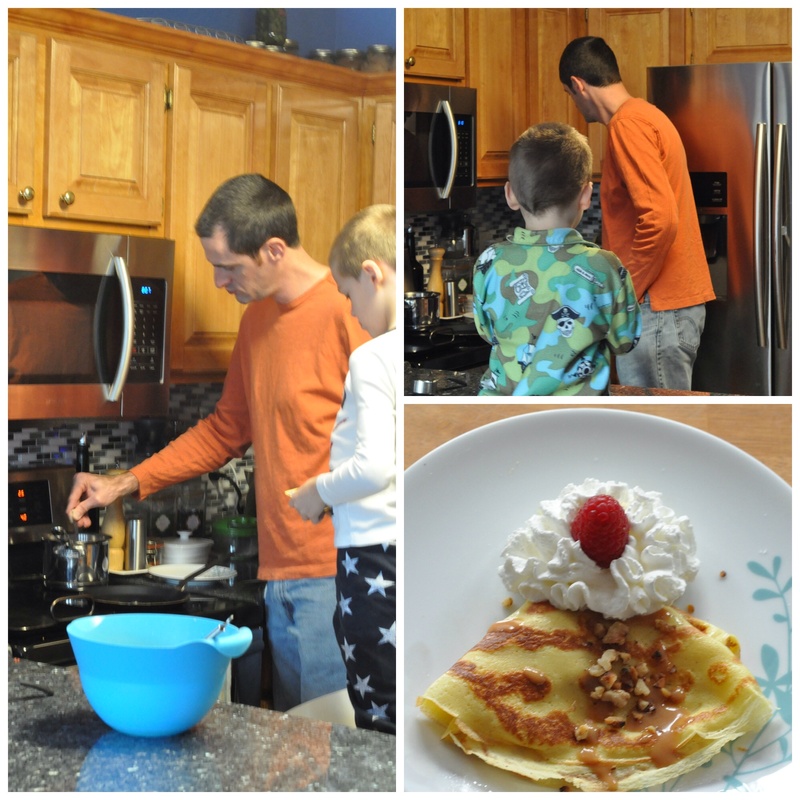 We each have our specialties for weekend breakfasts and hubby makes the BEST crepes! It is a very popular favorite which started out as a tradition on Formula One weekends. Hubby is an F1 fan and most races are on in the morning here so for some reason we would kick off the races with crepes and mimosas. Oh yes, I’ve had some very delicious Quark Torte as well. I’ll have to look through some of my German cookbooks. It also makes a good savory sauce for meat dishes. Sweet potatoes are indeed wonderful, so many topping possibilities and full of many nutrients. Hi Gretchen, I love quark with roasted strawberries. I am sure you will find millions of ideas. Yum, quark with roasted strawberries sounds delicious. I’ve had it with all kinds if fresh fruits, never thought about adding roasted or grilled fruit. The fruit arrangement was fabulous, such a delicious and practical gift! The fruit bouquet was so delicious! Weekend breakfasts are so delicious, plus it is nice to have the whole family cook together. The boys have requested a cooking lesson this weekend since they want to serve us breakfast in bed but can’t make anything themselves! The brioche was so delicious, I see lots more in our future. The brioche looks really tasty, no wonder its proving so popular. I’m sure we will be making lots more brioche! So many choices for add ins too, I myself am craving apricot vanilla. 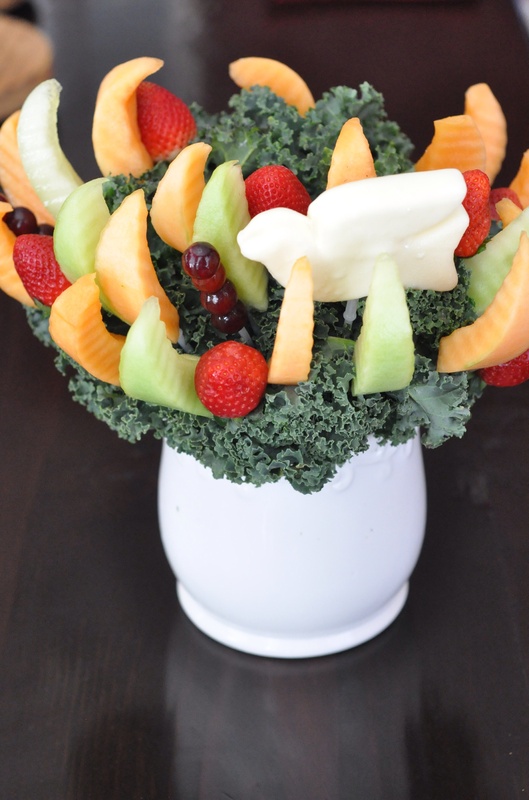 I love the idea of an edible arrangement – so clever. The bread looks divine! I’m just starting to get back into enjoying bread baking. And the edible arrangement is a lovely idea, for a sad occasion. Bread baking is so rewarding since the end result is far superior to anything from a store. The added bonus is the smell of baking bread throughout the house! Gretchen that orange & ginger yogurt sounds good and that Banana mango did you find that Whole Foods too…I must look for that one here 🙂 yum!!! All the yogurts were from Whole Foods. The banana mango is awesome because I comes in a neat little glass jar! Good luck finding them. There is something so wonderful about fruit arrangements. I love flowers too, but you can’t eat them! ooh those crepes look good. 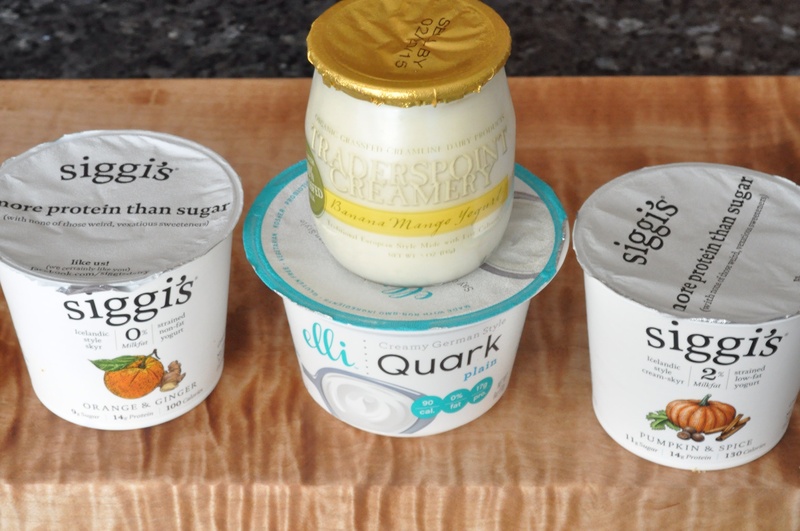 i have never had quark – a bit like cream cheese or cottage cheese? Kind of a cross between cream cheese and cottage cheese or farmer’s cheese. It is extremely versatile in sweet and savory dishes. My. Mouth. Is. Watering. What a great stash of goodies. I with your boys… I would want brioche all the time too. I can’t blame them either, I would love brioche all the time too! Always busy isn’t it?! I. Sure your house is even crazier, I’m not looking forward to more activities as they get older. Or how am I ever going to have enough food or time to cook for three teenage boys??!! I have no idea how we will ever feed all those boys when they are teenagers! This all looks so delicious. I love the idea of a fruit bouquet and your brioche is AMAZING! Unfamiliar with bostock, but right now at 5 a.m. I crave a double serving. Do you deliver? Mmmm, the brioche look pretty tempting as well. I was not familiar with Bostock either until I found it on Pinterest. I’ll send two virtual pieces your way! Still anxiously checking my mailbox every day for the starter!